When selecting a bird house for your yard, it is important to keep in mind the type of bird you would like to attract. Bird houses come in all shapes and sizes, but birds are not picky about the outward appearance. Keep in mind the size of the house, the size of the entrance hole, and the height of the box above ground when purchasing a house, since these features are most important to birds. 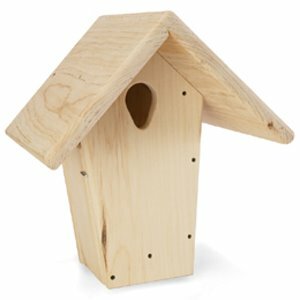 One type of bird house that is ideal for attracting birds to your yard is the nest box. Nest boxes make are great for attracting a variety of birds including bluebirds, wrens, chickadees, finches and more. They are made of wood, easy to place in multiples and can be customized for your yard. An ideal nest box for attracting bluebirds is the Bluebird Nest Box by Droll Yankees. This pine box has features that any bluebird would love. The roof is made to be extra large and has a large overhang to protect birds and eggs inside from the elements. The entry hole is designed to look like a natural cavity hole for attracting bluebirds. In addition, the box is vented on the sides for improved air flow. The box also has a side door for easy access for cleaning. To give the box a more natural look, it may be painted or stained to blend in with your outdoor surroundings. The more natural looking boxes tend to attract more bluebirds because they are naturally attracted to cavities. Another great next box for your yard is the Cedar Wren and Chickadee house by Audubon. This sturdy, wooden box is made of cedar wood that is high in natural resins to keep it looking great for years. The roof has an overhang to help protect the birds and eggs inside. To attract wrens, place a few of the boxes in secluded locations in your yard away from direct sunlight. Remember that it may take a little to attract birds to your yard and placement of the nest boxes is critical. Birds like homes that are secluded and replicate a natural cavity. It is a good idea to place several types of nest boxes in your yard, so your birds have a variety of homes to choose from. Place boxes about 30 feet from each other. birdhouses �at GregRobert Wild Bird. This article may contain affiliate links, which means you are helping support the maintenance of this webiste if you make a purchase using the link. Rest assured though, we are not paid for any product opinions.